Up until recently, there was a big old oak tree out in my front yard. It was very old. I literally grew up and old with this tree watching over me for the past 52 years. I have so many wonderful memories tied to that tree. I wrote a little reminiscence about the tree a few years ago. I was attached to the old fellow. Unfortunately, he’s gone now. This is all the city tree crew left of him recently. The tree had been dropping some rather large branches over the last couple years during some of our normal summertime afternoon thundershowers. The tree is on city easement, which means it’s their responsibility and liability should something happen to injure someone or damage something. Back in September, the city forester came by and inspected the tree. He condemned it at that time. I tried my best to appeal, but they weren’t going to budge. I lost my old friend on my father’s birthday (11 March), just a couple weeks ago. Sure. “It’s just a tree,” some of you are saying. 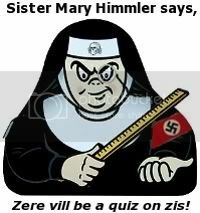 Well, that’s true. It was a tree, but it was one that was practically a member of my family. I was born and raised in this house. I spent my childhood in the shade of that tree, as did my older brother, and many, many of our neighborhood friends. When I was little, the neighbors and my parents would bring over lawn chairs and sit out under that tree till late in the evenings talking and laughing while the children played around them. It was a different world back then. Sadly, that world is as gone as my old oak is. When the forester was here on that day back in September, he told me about something the city had going called “The Tree-mendous Community Tree Program.” The city will, at no cost to the homeowner, plant one tree per lot on the city easement at the request of the homeowner. It’s a program with the aim of beautifying and enhancing neighborhoods by planting new shade trees. He gave me a link to their website where I could check out the choice of trees they offer and set up a appointment to have someone come out and talk with me about it. So, that’s what I did. Initially, I wanted a nice fast-growing red maple, but the fellow who came out to talk to me talked me out of it for two reasons: they weren’t happy with the quality of the red maples they were getting from their current contractor and because they removed a laurel oak, they would prefer that I choose a live oak to replace it. The idea is to keep the neighborhood’s tree personality intact, so to speak. Laurel oaks are pretty, but they’re not as sturdy or as long-lived as live oaks. Unfortunately, live oaks don’t grow that fast. I figured, if I wasn’t around long enough to enjoy the live oak, maybe some other folks after me will appreciate its shade and beauty after I’m gone from this place. With that in mind, I went ahead and ordered the live oak from the city program. Daniel, the fellow who came out to talk with me placed a little white flag in the yard so the crew would know where to plant the tree. He told me they’d be back in a week or two. In that center picture, you can see the stump of my old oak in the background. It’s kinda’ sad, but life doesn’t give up easily. When I walked over to look at the stump while out there snapping these shots, I noticed a tiny little baby oak growing out of the old stump. The city is supposed to come back and grind the stump down for me. I might just tell them to leave it alone. Maybe one day, that wee little thing growing out of the stump will look like the might oak that once stood there and watched over me as I played under its storied boughs. Posted by V. T. Eric Layton on 27 March 2014 in Around the Home, Reminiscences and tagged childhood, City of Tampa, Daddy, free trees, Laurel oak, Live oak, memories, oak trees, pollen, Red maple, The Old Oak, Tree-mendous Program, treehouse. Maybe you can snag that little guy before it gets too big and transplant it to a better location? Then you can let them grind the stump and still have your new tree. 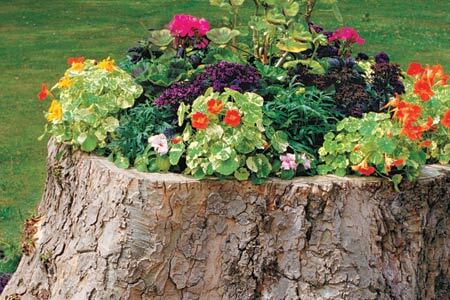 I’m thinking of making a flower planter out of that old oak stump. I’ve seen people doing this around the neighborhood and online. It’s a way to recycle, sort of. I might just call the city forester on Monday and ask that they don’t come back and grind the stump; just leave it be. I hate to loose trees. I’ve had to take two badly damaged ones out in the 16 years I’ve been in this house, and I still miss both of them. Sounds like a good plan if you can hold off the City Forester. The stump will eventually rot away, but not for a good many years. Oh, as busy as they are, I’m sure he’ll be more than happy to not have to tie up half his crew to come back here and grind this stump. I’ll call on Monday and see. Yeah, the old stump will rot away, however, the little oak tree growing from it right now will be pretty big by then, if it survives. I’m sure it will these laurel oaks are pretty sturdy, and grow MUCH fast than my new friend the live oak. My mother keeps an eye on a few oak trees (red?) that are at the back of the lot where I grew up. One of us (mom says me) planted the trees from acorns across the street. So they must be around 40 years old. That sure was a beautiful tree, Eric! I look out there every day and miss it. The little sprout growing in the trunk is doing fine, as is the new live oak the city planted for me. One day they’ll be grand, like the old guy was.